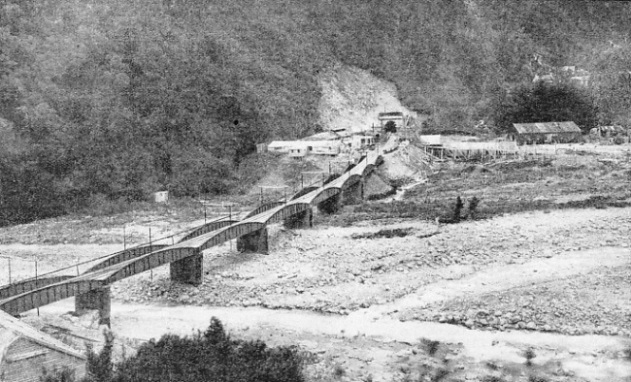 THE OTIRA ENTRANCE to the tunnel, photographed while constructional work was in progress. This end of the tunnel is in the gorge of the Rolleston River, about three and a half miles from Otira Station, and at this point is 1,586 feet above sea level. THE most spectacular piece of railway engineering yet carried out in the Antipodes is the building of the Otira Tunnel amid the snowcapped peaks of the Southern Alps in South Island, New Zealand. It is the longest tunnel south of the Equator and the longest in the British Empire. It took fifteen years to build and cost £1,500,000. Over and over again it looked as if the work of boring an opening for the railway through the mountains would have to be abandoned. No railway project evoked such interest and was the cause of such agitation as this line of about a hundred and fifty miles, which crosses the mountainous ranges of South Island by a great summit tunnel. A prominent physical feature of New Zealand is a lofty chain of mountains running after the fashion of a huge backbone through both North and South Islands. The advance of the railway builder has therefore been beset with abnormal obstacles, recalling the conquests of the Rocky and Cascade Mountains in North America. The outstanding feature of New Zealand’s railways is the amazing number of bridges, the cost of which must represent a huge sum. In the early days chasms and gorges were spanned by wooden structures, but these have since been replaced by substantial and often lofty steel structures. Whenever the engineer has tried to leave the coast on either side of the islands the mountains have reared up to dispute his advance, and it has been only by great effort that the railway has been carried over or through these mighty barriers. The scene of the feat under notice is in South Island, on the railway that runs from Christchurch, on the east coast, to Grey-mouth, on the west. This is one of the most fascinating railways in the world, passing through magnificent mountain scenery. South Island, with a length of some 500 miles, and an average width of about 120 miles, is intersected almost throughout its entire length by the high mountainous ranges of the Southern Alps. Some of the summits of the range reach a height of 12,000 feet, Mount Cook, the highest point, rising to 12,349 feet. To the railway engineer, anxious to connect the settlements on one side of the island with those on the other, these mountain ranges have proved a great stumbling-block. From the earliest days of colonization the question of railway communication between the fertile plains of Canterbury, on the one hand, with the rich timber and coal lands of Westland, on the other hand, had attracted serious attention, more especially among the residents of Canterbury and Westland. 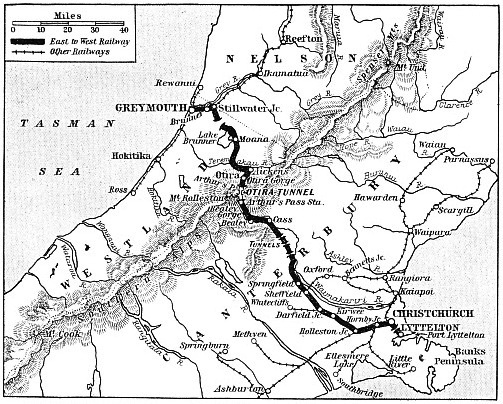 Their idea was the building of a railway across the Alps from Canterbury on the east side to Greymouth on the west. Greymouth is of little use as a port, as it has a bar harbour, but in its neighbourhood there are timber and coalfields. No steamers from Europe or America normally call at Greymouth, but Lyttelton, the port of Canterbury, has facilities for the discharge and loading of such vessels. It is one of the principal ports for the shipment of frozen mutton. Surveys and explorations for the purpose of discovering the best route over the mountain ranges were put in hand at an early date. Some were carried out by the Government and others by private enterprise. Surveying proved arduous and dangerous work, for much of this mountainous terrain had not been fully explored. Some of the surveying parties were lost among the mountains and expeditions had to be sent out to rescue them. In 1864 Mr. Arthur Dudley Dobson discovered an opening between the mountains, now known as Arthur’s Pass. It is the meeting-place of two fairly low but picturesque valleys, across the flank of Mount Rolleston, a peak of 7,453 feet. On either side of the pass are two deep gorges, the Bealey Gorge and the Otira Gorge. Ten years later the New Zealand Government passed an Act authorizing the carrying out of a survey for a railway between Christchurch and the settlements on the west coast. Surveys had already been made. Indeed, eleven possible routes over the mountains were available. Fresh surveys, however, were undertaken, but nothing more than this was done, and the citizens of South Island formed a Railway League. The league collected data, held public meetings, and interviewed the leading shippers, merchants and others concerning the proposed undertaking. Bill after Bill was brought before the New Zealand Parliament asking for the sanction of the railway, only to be turned down on some such point as the feasibility of the route or the question of expense. The outcome of the agitation, however, was that a special syndicate, known as the New Zealand Midland Railway, Ltd, was formed. The land over which the company had control aggregated about 6,000,000 acres, with an estimated value of £3,000,000. Between 1886 and 1895 work proceeded vigorously, but when about thirty-five miles of the line had been completed the physical difficulties to be overcome were so great that the company shrank from attempting the apparently impossible, and the ambitious idea was abandoned. The Government, determined to penetrate the mountain chains at all hazards, took over the work. After 1895, work was pushed ahead on either side of the mountain range, and in 1900 a committee of engineers was set up to consider the best way of crossing the dividing range. Up to this time the idea had been to carry the line over Arthur’s Pass, whose summit is some 3,000 feet above sea level, by the centre-rail Fell system at a gradient of 1 in 15. 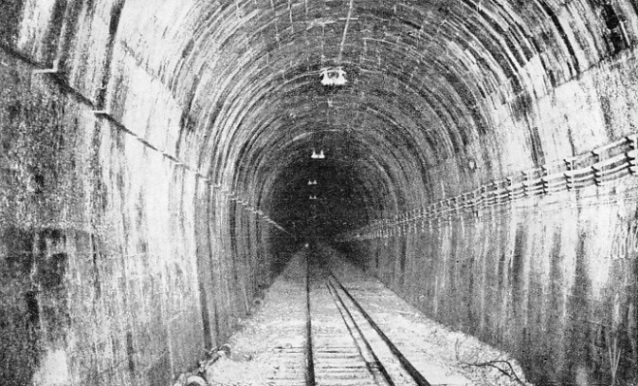 After long consideration, and on the advice of Mr. V. G. Bogue, an eminent American engineer, who had been called in by the Government, the idea of a rack railway over the pass was abandoned and it was decided to build a summit tunnel, over five miles long, with a grade of about 1 in 33. The location of the tunnel having been decided, final surveys were at once made for the purpose of carrying out the work. A line was ranged out over the mountains from one end of the proposed tunnel to the other, a series of trigonometrical stations was established, and precise levels were carried from one side to the other. Because of the mountainous nature of the country and the severe weather experienced, the work was carried out in exceptionally trying conditions. For days together surveying parties were held prisoner in improvised shelters among the snow-clad mountains. The Canterbury end of the tunnel is at the summit of the line between Christchurch and Greymouth, and is in the valley of the Bealey River, near Arthur’s Pass Station. The Westland end is in the gorge of the Rolleston River, about three and a half miles above Otira Station. Otira is about fifty-two miles from Greymouth, and Arthur’s Pass is about eighty-five miles from Christchurch. FROM COAST TO COAST - connecting Christchurch with Greymouth - runs the railway whose building was made possible by the vision and work of the engineers who planned and built the great Otira Tunnel. Eleven possible routes over the mountains were available, and until 1900 it had been proposed to carry the line over Arthur’s Pass. In that year it was decided to build a summit tunnel, but the work did not begin until 1908. The tunnel has a total length of five and a quarter miles. Compared with those mighty openings which have been driven through the Swiss Alps - the Simplon Tunnel is over twelve miles long - the Otira Tunnel may at first sight appear insignificant. But the conditions are entirely different. The perpetual snowline of this particular section of the New Zealand Alps is from 3,000 to 3,100 feet lower than that of Switzerland, and the glaciers descend to a much lower level. The operations had to be carried out on a snow-swept pass in the heart of what was then a virtually unexplored wilderness. In 1908 a contract for the boring of the tunnel was let to a New Zealand firm of engineers for the sum of £600,000. As soon as the contract had been let the engineers lost no time in setting about their great task, though they could not begin boring the tunnel immediately. Rough trails had to be made from railhead to the site, plant and materials accumulated, and accommodation for the workers provided. 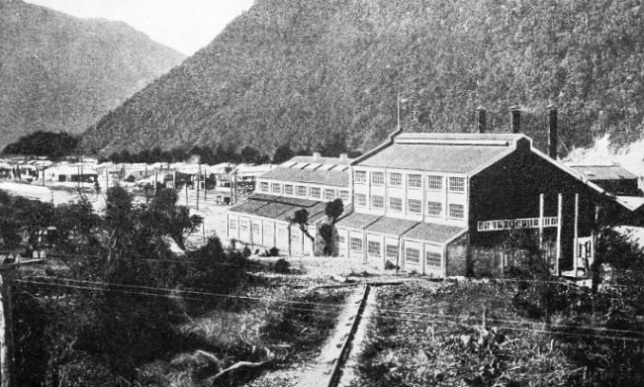 One member of the firm went to Europe to procure the requisite plant, while another engineer established himself at Otira and began the building of a small settlement at either end of the tunnel, and otherwise preparing the way for a prompt start on the boring as soon as the plant should arrive. At that time the Lotschberg Tunnel was being built through the Swiss Alps, and as air drills were being used successfully there, they were also adopted by the New Zealand engineers. The boring was conducted from either end of the tunnel simultaneously. Sir J. G. Ward, as Prime Minister, fired the first shot on May 5, 1908. Three shifts of men were employed every day, each shift working eight hours. As the work progressed the contractors found themselves confronted by many unexpected difficulties. One of the worst was the encountering of stretches of rotten rock or crumbling shale, which necessitated tremendous expenditure in timbering and lining. Unfortunately several serious accidents occurred. At the east end, for 1,000 feet or more from the portal, the tunnel runs close to the river, under a steep hillside, and with little cover. At a point where the arch of the tunnel was within 30 feet of the surface the roof collapsed for a distance of some 50 feet. Several men were caught in this fall of the roof. Two of the men were imprisoned in the debris and four days passed before they could be rescued. A shaft had to be driven from the river side to get them out. The men emerged unhurt. During their imprisonment conversation was carried on with them through the 5-in air-main. Down through this pipe dry clothing and provisions were passed to them. Serious and fatal accidents were few, but a hospital with doctors and nurses was established at Otira to deal with any injuries the workers received. Most of such injuries were caused by falling rock. The troubles of the contractors were many. There were industrial disputes, including a strike. Good wages were certainly paid, and there was a system of wage bonuses according to the progress made. Not least, there were the climatic conditions. The winter storms were severe and it was dangerous to move far away from the camps. In the spring, when the melting snow and ice were followed by torrential rains, the camps and works were flooded. In the height of the summer the heat was often intense. The average annual rainfall of the region is as much as 16 feet. Rain turned everything into a quagmire and made progress difficult. The work continued until the spring of 1912, when the contractors asked to be relieved of their responsibility. They had spent £250,000 on plant and material alone, having entirely miscalculated the cost. They had done their best, and some two and a half miles of the tunnel had been excavated, camps established, and important gorges bridged. A Parliamentary Committee was set up to inquire into the whole affair. It declared that the task was one which no private contractors would be prepared to face, and recognizing the national importance of the work, stated that it should be undertaken by the Government. This was promptly done. DEAD STRAIGHT FROM END TO END, the Otira Tunnel has a total length of 5 miles 445 yards and a continuous gradient of 1 in 33. It has a clear height above rail level of 15 ft 6-in and a maximum width of 15 feet. When the two headings met, it was found that the alinement was only three-quarters of an inch out, the difference in level being 1⅛-in. The summit tunnel, though the most daring and spectacular feat on the line, is but one of many such achievements, for the bridges and shorter tunnels compel just as much attention. In a short length of nine miles there are three steel viaducts, one of which carries the rails 236 feet above the floor of the gorge, and no fewer than seventeen short tunnels, the longest of which is about 2,000 feet. There is scarcely a mile of level in the whole line. A great amount of work has also been done in protecting the railway embankments from mountain torrents, which run at a terrific pace in flood time. The official length of the summit tunnel is 5 miles 445 yards. It enters the range on the Canterbury side at an altitude of 2,435 feet and emerges on the other at an altitude of 1,586 feet above sea level. It has a continuously falling grade of 1 in 33. Thus from one side the excavation work was carried on uphill and from the other side downhill. The tunnel has a clear height above rail level of 15 ft 6-in, with a maximum width of 15 feet, and is lined with concrete throughout its length. It is bored through solid rock except for a few hundred feet at the portals. Those who expected some interesting geological discoveries during the big drive through the range have been disappointed. The rock was monotonously alike right through, varying only in degree of hardness. The rook lies on its edge in more or less vertical beds of greatly varying thickness. It is jointed in all directions and is badly fissured. It is of such a nature that explosives can be used to great advantage; but it is gritty and hard on the drill steels used for boring the holes for blasting. Indeed, the drilling proved exceptionally difficult, and everything possible was tried to harden the drill bits so that they would stand the wear and not break. Temporary timbering was used throughout to prevent flaking of the rock surface, and fairly heavy timber was necessary in some of the worst places where faults in the rock structure were encountered. When these big tunnels are driven under the mountains, large pent-up bodies of water are often struck. It was so at Otira. Over and over again water was being tapped. Sometimes the flow was as high as 3,000 gallons a minute, flooding the works and greatly hindering operations. This water difficulty was trying where the excavations were driven on the down grade. A powerful pumping plant had to be installed to deal with it. The excavation was carried out by the bottom-heading method. The face of the tunnel was divided into two sections, the lower portion being driven first. As a rule a bottom heading, or drive, about 8 feet high and 10 feet wide, was first excavated; when this had advanced far enough a top heading was driven. This method allowed more men to be employed in the workings than if the tunnel had been excavated in one face. The best average rate of excavation was 13 ft 6-in a day for twelve consecutive working days. As the rock and debris were loosened they were tossed into trucks and hauled out of the tunnel by electric mine-loco-motives. The headings were timbered as required, and when the full section has been excavated it was also timbered ready for concreting. The concrete lining of the tunnel was kept as close to the full section excavated as possible. All concrete was machine-mixed, and the concrete blocks in the top of the arch were made outside the tunnel and were allowed to mature for three months before use. THE ARTHUR’S PASS ENTRANCE to the Otira Tunnel, on the Canterbury side. This is the highest point of the tunnel, the altitude being 2,435 feet above sea level. At this end, for 1,000 feet or more from the entrance, the tunnel runs close to a river, under a steep hillside and with little cover. At either end of the tunnel hydro-electric plants were installed to supply the motive power for operating the machinery used in connexion with the work and for lighting the tunnel. Lighting outside and in the finished parts of the tunnel was by electric incand-escent lamps. In cramped working places, however, the miners carried hand-lamps. In a tunnel more than five miles long adequate ventilation is absolutely necessary. With explosives and dust the air at the face workings of a tunnel quickly becomes impure. At either end of the tunnel was installed a powerful blower, with a capacity of 4,000 cubic feet a minute. It carried the pure air through 16-in pipes to the face workings, thereby quickly exhausting or driving away any impurities in the atmosphere and ensuring a supply of fresh air to the workers. Less than two years from the time the Government took over control the war of 1914-18 broke out, and this hindered the work considerably. Indeed, the staff at the tunnel was reduced from just over three hundred men to less than a hundred and fifty. Wages rose by 50 or 60 per cent. The cost of material was in some instances more than doubled; cement, for instance, rose from £4 a ton to £9 and £10 a ton, and was at times almost unobtainable. On one occasion, the concreting work had to be stopped for a short time as no cement was available. The work of excavating the tunnel, however, was pushed steadily forward, and on May 7, 1918, the men at the Arthur’s Pass end heard the sound of the firing of the charges used in the bottom heading at the Otira end. Keen interest was aroused, as is always so when miners, tunnelling from opposite directions, are about to pierce the last barrier. When will they meet and will the alinement be correct? Some eight weeks later the sound of the rock drills working on the face at the Otira end was heard by the Arthur’s Pass workers, who were about 200 feet away. Shortly after this, on July 29, the bottom headings met - 3 miles 68 chains 10 links having been driven from the Otira end, and 1 mile 37 chains from the other. The total distance bored - 5 miles 25 chains 10 links, or 5 miles 552 yards - was somewhat greater than the official length of the tunnel. The meeting of the headings showed that the surveys had been made and the tunnel driven with remarkable accuracy. The difference between the actual length and the calculated length was 36-in, the difference in level was only 1⅛-in, and the alinement was extremely accurate, being only ¾-in out. On August 21, 1918, the final barrier in the bottom heading was shot away by a charge fired by Sir William Fraser, then Minister of Public Works, and some three years later the whole of the excavation was lined and completed. The tunnel necessitated the excavation of 312,816 cubic yards of rock and 10,700 cubic yards of earth. 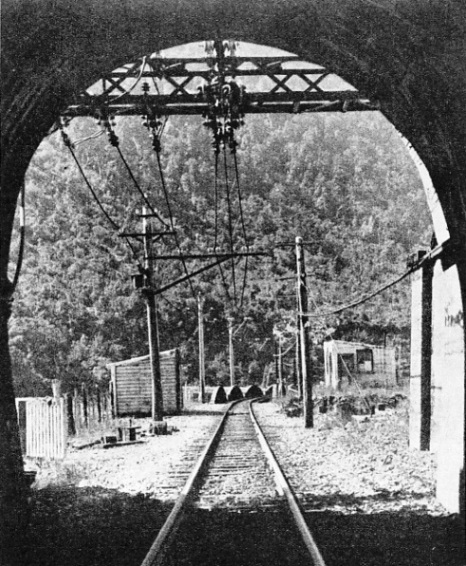 Because of the steep grade and the difficulty of dealing effectively with the smoke from steam locomotives, it was decided to electrify the line through the tunnel. A power house was therefore built at the Otira end of the tunnel. The building and equipping of the power station demanded great resource, because of the trying climatic conditions, the torrential rains and the heavy winter snows. A reservoir had to be built among the mountains some 625 feet above the power house. The reservoir had to be protected from avalanches, and water taken from it by pipes. The station is equipped with two turbine-driven generators of 1,600 kilowatts capacity. It was not until 1923, some fifteen years after the contract for building the tunnel had been signed, that trains began to pass through the Empire’s longest tunnel. It carries a single track, the gauge being 3 ft 6-in, which is the standard gauge in New Zealand. The tunnel runs dead straight and, standing at one portal it is possible to see right through it, though the daylight visible at the opposite end is but a pinhole. THE GREAT POWER HOUSE at the Otira end of the tunnel is equipped with two turbine-driven generators, which are driven by water from a reservoir some 625 feet higher up the mountain. The building and equipping of this power station were made difficult by torrential rains and heavy winter snows, and the reservoir had to be protected from avalanches.